Southeast Asia is fast becoming one of the hubs of the Fourth Industrial Revolution. Over the past five years, the region has established itself as a leader in implementing the latest technologies such as blockchain, artificial intelligence (AI), robotics, cloud computing and fintech among others. However, for such technologies to truly reach their fullest potential, the current state of the internet, simply will not be enough. Currently, internet service providers and mobile service providers only provide 3G or 4G internet in the region. However, the era of 5G could arrive soon. 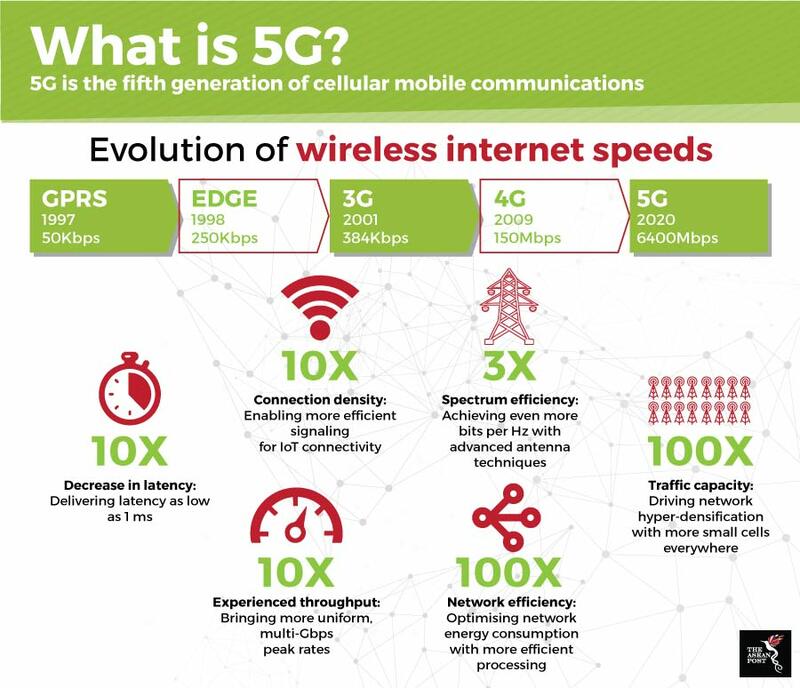 5G is the fifth generation of cellular mobile communications and is the successor to 4G (LTE/WiMax), 3G (UMTS) and 2G (GSM) systems. 5G connectivity is expected to come with a much higher bandwidth and reduced latency which could save energy and reduce costs. Countries in the region are already planning to develop and deploy 5G. Malaysia is reported to have started running tests for 5G. Cambodia and Thailand have also said that they would want to see 5G deployed in their countries in 2021. Indonesia have also dabbled with 5G internet. Recently, two local mobile network providers Telkomsel and XL conducted 5G trials during the 2018 Asian Games. In the Philippines, work is already being done to usher in 5G. Philippine telecommunications firm Smart has already announced plans to deploy a 5G pilot network in the first half of next year, while Globe Telecom has said that a 5G network could be available as early as the second quarter of 2020. Much like how 3G and 4G internet revolutionised streaming services, the introduction of 5G in the region could see the emergence of new industries and technologies. Essentially, 5G can bring about much greater mobile internet speeds, which could make many services more efficient. On top of that, 5G also brings with it much lower latency, meaning there will be quicker response times between networks and requests. Lower latency will be particularly important for devices that require great amounts of data. For example, latency is key in setting up autonomous vehicles and self-driving cars systems. These vehicles process a large amount of data and are also exchanging data with traffic lights and other vehicles; hence latency could literally be the difference between life and death. In Singapore, authorities have said that they are planning for drone and autonomous vehicle trials over its 5G pilot network. Today, more than half of ASEAN’s population resides in urban areas. By 2030, urban centres in the region is expected to be home to 90 million more people than it is today. Such rapid urbanisation could have implications for important issues such as congestion, water and air quality, and housing. With these problems in mind, ASEAN is looking to technology to be among the solutions. Last year, ASEAN rolled out the ASEAN Smart Cities Network where 26 pilot cities in the region were identified to integrate technological solutions. To implement such technological solutions, 5G internet is essential. A smart city functions on the quick and efficient transfer of large amounts of data, as different elements of the city will be able to communicate with each other. Think traffic systems and public transportation systems in communication with weather devices. By that point of time, the internet will be central to the organisation of human society. Implementing 5G will initially be challenging as deployment costs could be high since new infrastructure needs to be built. There are also concerns that companies could charge higher prices for access to 5G. However, just like 3G and 4G, prices will most likely plummet once it is easily accessible. It is also important to note that 5G by itself will not be a silver bullet to solve the many problems of the region, but it can certainly make the region’s journey to the 21st century much quicker.